Police today arrested the Taco Bell employee accused of striking his manager with a “hot burrito” during a tirade about having to work the morning shift at a South Carolina restaurant. 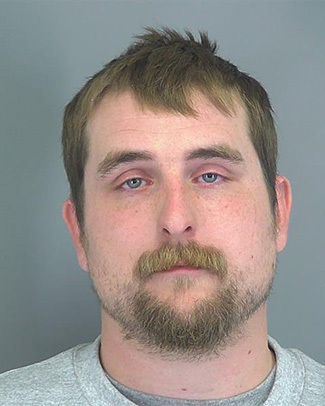 Christopher Dalton, 28, was collared around 10:30 AM by Spartanburg cops and booked into the county jail on assault and battery and malicious damage charges. Dalton, pictured at right, is scheduled today for a 5 PM bond hearing on the misdemeanor counts. Keeley told cops that when she told Dalton to “stop being a crybaby,” he “slung” a burrito at her. “The melted cheese got all over her left arm and went all down her left side and leg,” cops noted. The thrown burrito also “made a mess of the entire kitchen as well, getting cheese over all the appliances,” Keeley recalled. Before storming out of the Taco Bell, Dalton “took off his headset and broke it on his knee and threw it on the ground, causing it to break into several pieces,” the report states.